Attendees of the Georgia Education Technology Conference packaged meals for Atlanta food banks at the Georgia International Convention Center in Atlanta earlier this month. On a recent rainy morning, a turquoise charter bus pulled up to a Chester County, Pa., construction site, where two dozen volunteers piled out to pick up hammers and paintbrushes. These were not the usual tools of their trade. The volunteers were funeral directors. But on this day they were helping Habitat for Humanity build a house for a needy family. The funeral directors had been bused from nearby Philadelphia, where the National Funeral Directors Association convention would begin the next day. Business conventions in many fields have added community service to their meeting agendas, and the undertakers’ work with Habitat for Humanity showed a side that the public might seldom see. As with the undertakers’ meeting, many industry conventions now involve more than speeches, golf, and hospitality suites. As new generations of executives and professionals become leaders in their fields, some are emphasizing philanthropy over revelry when they gather for their annual meetings. Ace Hardware, for example, now routinely donates exhibitors’ construction supplies to local Habitat for Humanity chapters after its conventions; at least nine truckloads of supplies were donated after this year’s meeting in Chicago. The American Academy of Otolaryngology — Head and Neck Surgery provided free hearing tests for needy San Diego residents the day before its annual meeting started in that city this year. The Georgia Education Technology Conference, a project of the Georgia Education Technology Consortium, includes a two-hour session where attendees can help package meals for Atlanta food banks. 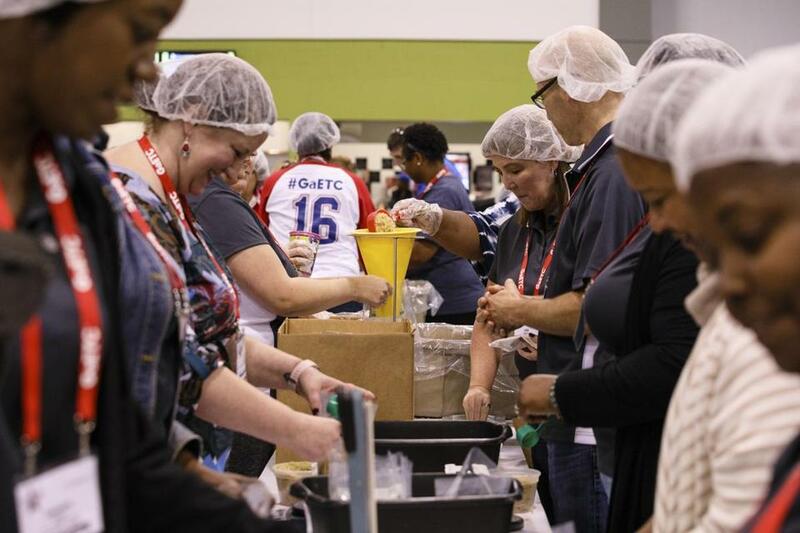 At this year’s recent conference, 250 volunteers packaged 41,280 meals. Whatever the professional field, volunteerism is catching on, said William Reed, senior director of meetings and community engagement for the American Society of Hematology and chairman of the board for the Professional Convention Management Association. The association has opened a website to help connect charities with convention leaders. The phenomenon is benefiting charities across the country. The Chester County Habitat for Humanity chapter received a flood of volunteer queries after it registered with the Pennsylvania Convention Center in Philadelphia, said Kim O’Toole, the chapter’s director of corporate relations and development. The impulse to volunteer is likely to continue as meeting attendees get younger, some experts say. Millennials are less likely than older generations to donate money to philanthropic causes, but seem to enjoy charity work, said Patrick Rooney, associate dean for academic affairs and research at the Lilly Family School of Philanthropy at Indiana University-Purdue University Indianapolis. And the trend could feed on itself, Rooney indicated, as cities and their convention centers and hospitality industries play up their connections to local charities in competing for the business of meeting planners.